Record Power has a well-deserved reputation for producing a wide range of machinery and tools to suit many workshop sizes, situations and price points. It should, therefore, come as no surprise to see that Record is extending its ever-growing hand tool range by introducing some bench chisels such as bevel-edge, mortise and specialist skew and corner chisels. The first two we will look at here. The bevel-edge chisels were sent to us in a pack of four with the following sizes: 6, 12, 20 & 26mm and have an RRP of Â£44.99 inc VAT. The chisel handles are a round/oval section and sport a flat on the front and back face, which prevents the handle from rolling about on the bench. The handles fit nicely in the hand and are available in nice light-coloured hornbeam finishes with a matt, non-slip finish. The ferrules are a pressed-steel slide-over section - the only bit of the tool, which I think lets down its appearance - up to which the bolster of the blade fits securely. The blades of the bevel-edge chisels are finely crafted and are thinner in section than many others. This means the thin-tapered side edges fit well in tight corners and are nicely balanced with enough meat to withstand the general rough and tumble of daily use. The blades have a very light layer of lacquer over them and a slight machine-ribbed finish. I always flatten the backs of chisels and on doing this on the bevel-edge chisels, I noticed that the ridging came out quickly and that the back wasn't quite flat. About 3-5 minutes on a stone sorted this out wonderfully to create a perfectly smooth surface, which in turn created a delightful cutting edge. 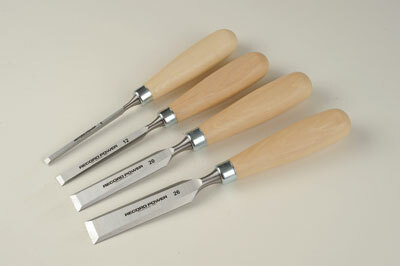 All the chisels are finely balanced and handle well. 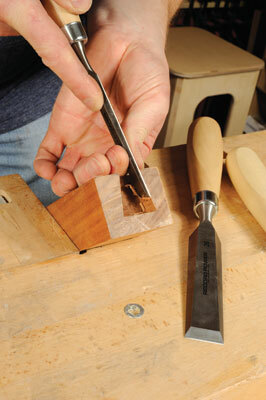 The trapezoidal profile, making the chisel wider at the bottom than the top, reduces binding when cutting deep joints. The edge that can be created on these chisels is superb and the edge-holding ability of the steel used for these chisels is truly excellent. These are well worth looking at and won't break the bank. A good quality set of mortise chisels is an often overlooked requirement in the workshop, despite their inherent usefulness.